Have you ever wondered what happened to your soda can after you threw it into the recycling bin? What if your soda can could be used to wrap up your left-over pizza? If you use the new Reynolds Wrap Foil from 100% Recycled Aluminum, that just might be possible! Reynolds Wrap is helping to turn your kitchen green with the introduction of their new Reynolds Wrap Foil from 100% Recycled Aluminum. The new recycled Reynolds Wrap is made from a mix of post-consumer and industrial aluminum. 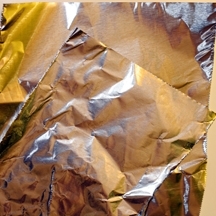 By recycling used or scrap aluminum into this food-safe foil, they are also able to save 80 percent of the energy it would take to make aluminum foil from new aluminum. So not only is this foil reducing the amount of waste that enters the landfill, it’s also reducing energy waste. 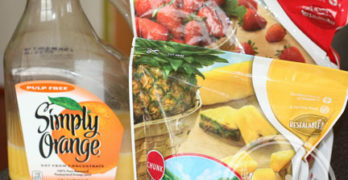 In addition to pulling aluminum out of the waste stream to make the foil, Reynolds Wrap also used recycled paper for the packaging and cardboard core, which are made from from 100% recovered paper. The recycled Reynolds Wrap Foil is available in both standard and heavy duty strengths. We tested out the Heavy Duty Reynolds Wrap Foil from 100% Recycled Aluminum last weekend when we BBQ’d (yes – we BBQ’d in the middle of winter.) Incidentally, the burgers we had were amazingly delicious! I’m not a huge eater, but I had two of the burgers plus a hot dog. Getting back to the foil, though. First, we used the foil to keep the food warm in the oven after pulling it off the grill. For being a heavy duty foil which is thicker than the normal foil, it held surprisingly well, keeping it’s grip around the edges of the pan and holding it’s shape. After eating our fill, we wrapped the left over hot dogs (which were still in the original plastic packaging) in a sheet of foil, and we were able to wrapped the package securely with the heavy duty foil. Verdict: The Heavy Duty Reynolds Wrap Foil from 100% Recycled Aluminum performed well for both BBQ foods and for wrapping up left overs. Here are a couple of pictures of how I used the foil. 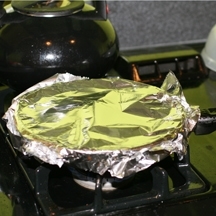 The first shows how I used the foil to wrap one of my smaller skillets while I steamed some veggies. I was really pleased with how I was able to get the foil lid to stay on the skillet and that the foil was molded and shaped to the edges of the skillet very easily. 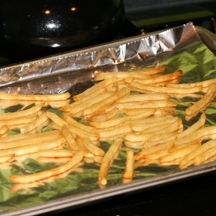 Next, I used the recycled Reynolds Wrap foil to line my cookie sheet for baking up some french fries. After baking the fries in the oven, the fries came off the foil easily and had cooked perfectly. The fact that I didn’t have to scrub the pan after baking the fries was a big plus too. Ultimately, Reynolds Wrap Foil from 100% Recycled Aluminum worked just as well as the original foil. I checked the prices online and it looks like there’s virtually no price difference between the recycled and non-recycled Reynolds Wrap aluminum foils. With all things being equal, it’s nice that we can no make an eco-friendly choice that appears to be a win-win situation for us, Reynolds Wrap, and the environment. For more information about the new 100% recycled aluminum Reynolds Wrap, visit www.reynoldsrecycled.com. 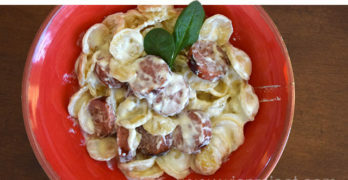 On the site, you’ll find several Green Kitchen Tips with useful suggestions on making your kitchen greener, a link to the Reynolds Wrap Facebook Page, and a coupon to get $0.50 off your next Reynolds Wrap Foil from 100% Recycled Aluminum purchase. Want to try the new eco-friendly Reynolds Wrap? Enter to win the WCatDD 100% Recycled Reynolds Wrap Giveaway! One winner will receive a box of the new Reynolds Wrap Foil from 100% Recycled Aluminum. THIS ENTRY IS REQUIRED FOR ALL OTHER ENTRIES TO BE VALID (+1): Visit www.reynoldsrecycled.com and tell me something you learned or something you like about the new Reynolds Wrap Foil from 100% Recycled Aluminum. Giveaway ends at 11:59 PM EST, January 14, 2010. Disclaimer: This post consists of my (and/or fellow tester) opinions only. No compensation was given for this review/giveaway. I will receive free boxes of Reynolds Wrap from the manufacturer or their representing PR agency to use and test for the purposes of this review. This did not affect the outcome of this review. I actually have never thought to use aluminum foil while baking brownies. This is a really great idea and would have saved me a ton of clean up if I had thought of doing this earlier! 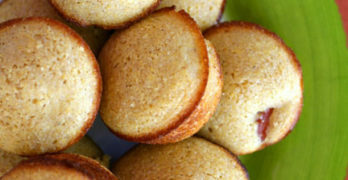 I also like reading about how this product is produced and now see that it is safe to use with food. I learned their motto: Reynolds Gives Green A Silver Lining”! I learned that even the box is made from 100% Recycled Paperboard. When they say recycled, they mean the whole thing! I learned their motto: Reynolds Gives Green A Silver Lining”! I learned that even the box is made from 100% Recycled Paperboard. When they say recycled, they mean the whole thing! I learned that Reynolds Wrap aluminum foil is packaged in a box made from 100% recycled paperboard. Way to go! I learned that one of their sources of aluminum is stadium seats! Isn't that a HOOT? Aluminum foil made from recycled aluminum is as clean and safe to use with food as foil made from new, also referred to as virgin, aluminum. The process of melting down the recycled aluminum requires heating the metal to more than 1200°F, which burns off any debris in the metal. Once it turns into a molten liquid, the aluminum is sent through a filtration process, poured and rolled into thin sheets. I really like the fact that Reynolds has a section on their website about how to make your kitchen more eco-friendly. The fact that this product is 100% recycled doesn't hurt, either! I learned that “Recycling is great, but using reusable goods and items made from recycled content material is just as important!” Thanks for the contest!